BBC News is an Android app developed by BBC Worldwide (Ltd) (BBC Worldwide Limited Television Centre 101 Wood Lane London W12 7FA). Others apps created by BBC Worldwide (Ltd) are: BBC Sport, WWD: Photo Adventure, BBCWWEvents, Race the Stig, TGSSR. BBC News first became available on 22 Dec 2011. BBC News has been awarded with the "Top Developer" badge. 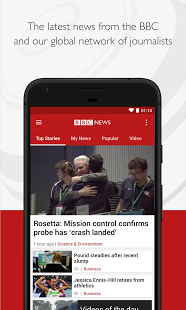 It is estimated that BBC News has been downloaded between 10000000 and 50000000 times from the Play Store. Don't get swayed, read news facts to have your own opinion on important issues.